Fort Thomas Lt. Rich Whitford reviews the case from today's home-invasion arrest of Ricky Dean Lovins. FTM file. Ricky Dean Lovins, 57 from Alexandria, was arrested Thursday morning and charged with Burglary 2nd after he allegedly broke into a Fort Thomas apartment in the early morning hours, rifled through drawers and lined his pockets with valuables before being chased out by the homeowners, who were sleeping just a few feet away. Lovins is accused of breaking and entering into 158 Churchill Apartments off of Grand Avenue near the city limits of Fort Thomas and Newport. The apartment complex is just across the street from St. Elizabeth Hospital. Lovins allegedly used a screwdriver to enter through this door, before getting into both a locked utility closet and disabling an alarm, and finally an apartment. FTM file. According to Fort Thomas Police Lt. Rich Whitford, officers were dispatched this morning after a 911 call was made and searched the area before arresting Lovins at the Fort Thomas Starbucks, where he was sitting at a table at around 5:30 a.m.
"He fit the exact description of what the victims gave us at which time he was immediately taken into custody and brought to the Fort Thomas Police Department," said Whitford. "Myself and Det. Adam Noe interviewed him, learned of his past, his whereabouts over the last 24-hours, and were able to get a confession out of him." Lovins told police that he sat on the bench here "to get out of the wind" after being escorted from St. Elizabeth Hospital, just across Grand Avenue from these apartments. FTM file. Whitford said Lovins' night started out at the Highland Heights Applebees, where he was creating a disturbance around 1:30 a.m. Highland Heights Police were called there and Lovins began to complain of possible heart problems. Highland Heights Police took him to St. Elizabeth Hospital in Fort Thomas for precautionary medical reasons. "He then caused a disturbance at St. E in the emergency room at which time he checked himself out and left on his own. He was escorted off the property by security and walked across the street to the Churchill Apartments complex. He was in that area for a while, from about 4:30 a.m. to 5:30 a.m. in that complex," said Whitford. According to Whitford, Lovins had a screwdriver which he used to force his way into the building, then into a locked utility room that housed the building's alarm system, before using the screwdriver and shimmy one last time to enter the victim's apartment. "While inside this couple's apartment, which they are in the bed sleeping, he went to the kitchen and got food out. He was making himself a meal. He had gone through some drawers and dressers and then went into the bedroom where the couple was sleeping and started taking jewelry off their dresser," said Whitford. "The couple woke up, startled of course. The victim yelled out and Lovins immediately fled, leaving his coat, a purse and wallet he had stashed by the front door." Whitford said they are in the process of going through the property to try to get things back to the victims after they made the quick arrest. "We're just thankful that they weren't injured. This old cat-burglar is one of the most dangerous because it is a pure home invasion where they don't care if someone is inside the house. They force their way in and that's where it becomes very dangerous for the victims." Lovins has been charged with Burglary 2nd, a felony. Whitford said they are also looking into charging him with Criminal Mischief for destroying the apartment's fire alarm and Possession of Burglary Tools. Lovins is currently housed in the Campbell County Detention Center and is awaiting his next court date on Friday, February 10 at 8:30 a.m. According to Police, Lovins has a very extensive criminal background history. 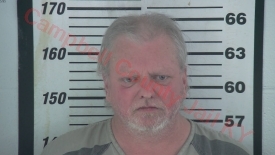 He had previously been charged and incarcerated for being a Persistent Felony Offender and is originally from Pulaski County in southern Kentucky. Ricky Lovins. Campbell County Detention Center. The building to the left is where Lovins allegedly broke into. The hospital across Grand Avenue is pictured to the right. FTM file. this is why i own firearms and have dogs. never ever afraid to use either.